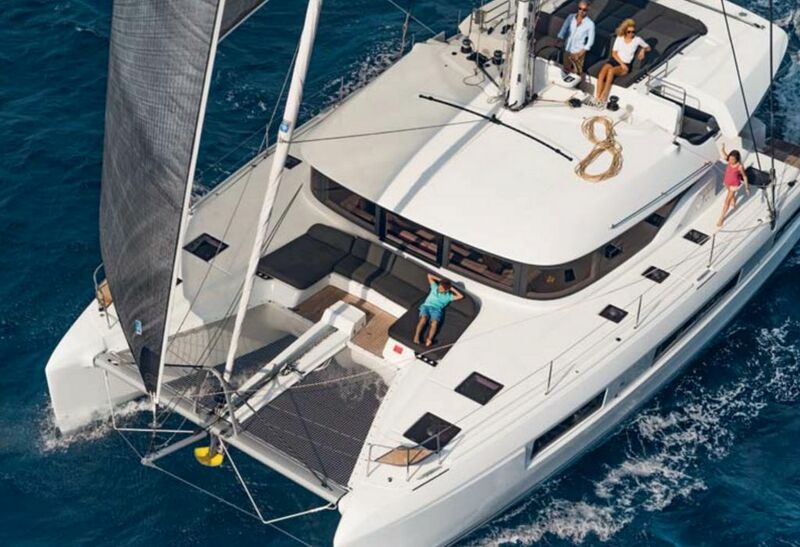 Among many of the boats that stood out at the recent 2018 Singapore Yacht Show was the Lagoon 50. Its sleek curves, two-hull design, and multi decks turned many a head at the prestigious three-day event held at Sentosa Cove. This boat is nothing like a traditional yacht – it has two hulls, which make it a catamaran. But once you step aboard this elegant craft it all starts to make sense. There is room. No, that’s not correct… there’s tons of room! In fact, the Lagoon 50 is more like a floating luxury apartment. The space alone makes this boat a real eye-opener and winner. Mr. Thomas Gailly, commercial director for Lagoon, says that these luxury catamarans seem to sell themselves. “Potential customers come aboard, get a look at the space and panoramic views and they’re hooked” Mr. Gailly says. As a result, there are so many orders there is currently a backlog. And it’s easy to see why. Lagoon goes the extra mile to make, as Gailly says, “every effort to ensure that our layouts are as luxurious and as clever as possible”. Statistics also show that eight out of every 10 catamarans in Asia are Lagoon builds. Even though they are more comfortable to sail, catamarans did have some serious flaws. The most drastic of which was ‘turtling’. If you turtled a cat it meant that the wind or waves could flip a boat upside down and it would be nearly impossible to recover the boat. Not something that you’d like to experience on a long ocean passage. Thankfully, today’s catamarans are very stable and no longer prone to turtling. Besides offering smooth, stable twin-hull sailing, they also have a very shallow draft (the depth of the hull goes below the water). The Lagoon 50 draws about 1 meter. You can take this boat where even a small mono-hull would never dream of going, which opens up all sorts of possibilities. Another benefit of the twin hull design is maneuverability when under power. With twin screws, one prop for each hull, you can maneuver the boat by controlling the power to each prop, which makes anchoring or getting in and out of port a breeze. And since you’re not pushing a lot of hull and keel through the water, as with a traditional yacht motoring, it’s very economical and easy on fuel bills. Lagoon also offers a range of ‘powercats’. Still, Mr. Gailly reports that Lagoon’s sail craft are the best sellers. He also says that families really like the 50. 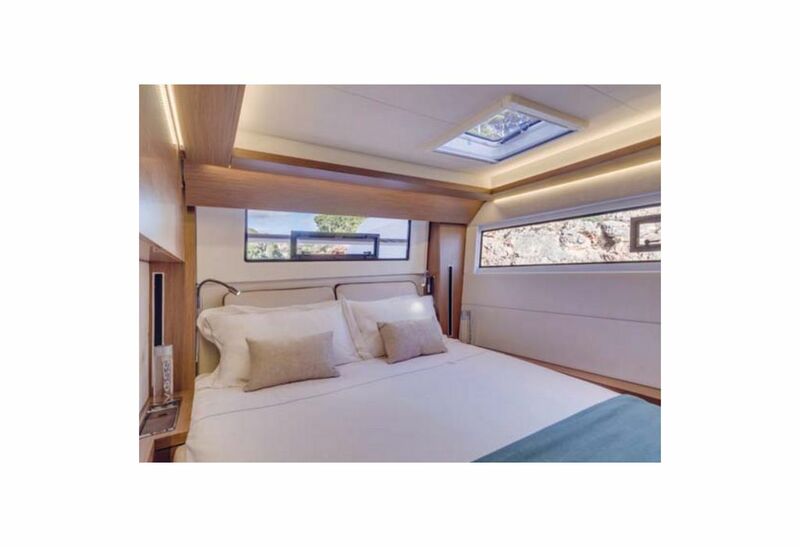 “There’s more room and even privacy aboard a Lagoon 50 than, say, a mono hull boat. 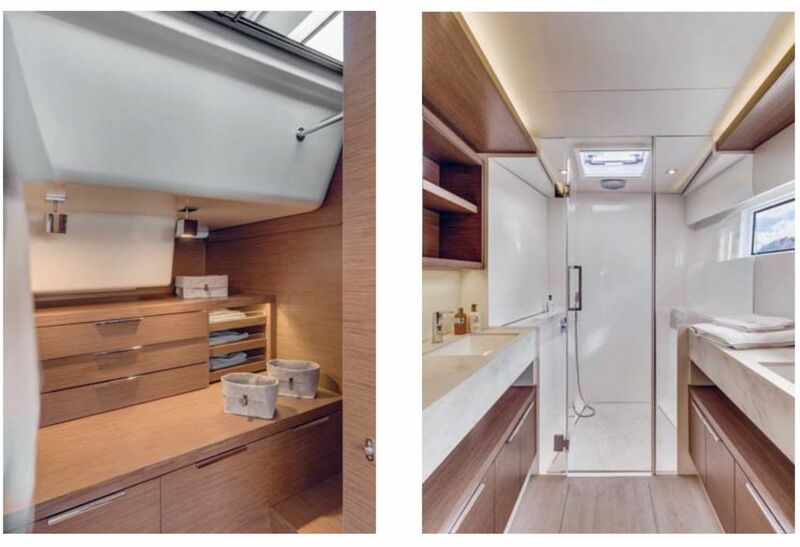 You’d have to have a single hull of more than 100 feet to get the space you have aboard the 50.” Many of Mr. Gailly clients see this boat as the ultimate escape to sail around the world. “Sadly, nine out of ten say that’s what they’re going to do but only one manages to achieve that goal,” he reveals. On the Lagoon 50 the mast is stepped further aft, allowing for more foresail and an easier to control mainsail. A self-tacking jib and shorter boom makes for more simplified sail handling. The Lagoon 50’s mainsail has a higher aspect ratio that optimizes performance with better airflow in the upper parts of the sail. Coming aboard the Lagoon 50 you’ll encounter a large open cockpit facing out to sea, large stern skirts enable easy access to the boat, and a large modular dining area with removable bench seats. A second cockpit on the foredeck has a dual function seating or deck chair position, flush with the forward trampoline. A flybridge with two secure accesses and a helm station provides perfect visibility. The large forward triangle in front of the dual helms (a Lagoon standard) offers a wider choice of downwind sails, guaranteeing visibility and performance. And behind the helm station, a huge modular recreation area conceals a large storage area for all the cushions. The two-hull design gives the 50’s interior generous volumes and natural lighting. All around the interior of the Lagoon 50 are windows for large amounts of sunlight and a mind-blowing panoramic view. Lagoon’s innovative saloon concept has two levels with two separate areas: a large galley that opens onto the cockpit on one side, and a slightly elevated lounge area for enhanced panoramic views, which can easily be turned into a dining area if needed. And this is just the main saloon. It’s easy to forget that there are two hulls, which house the more than spacious cabins. 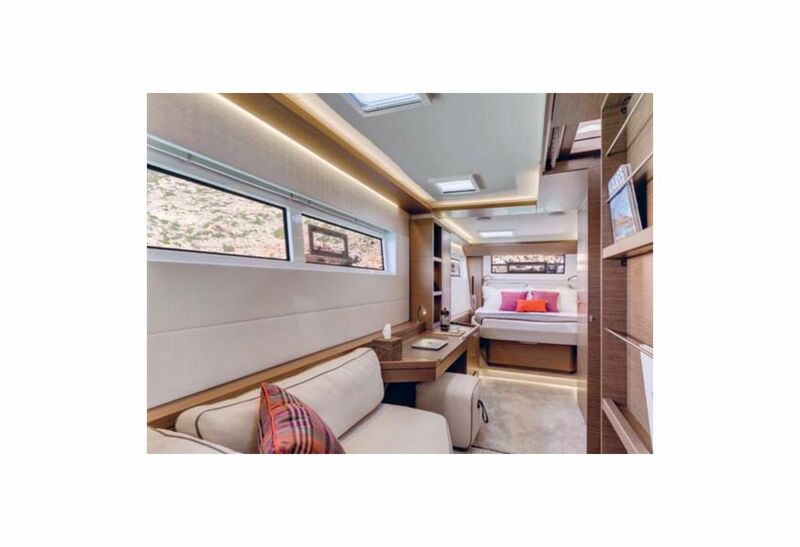 Lagoon 50 has quite simply one of the best-designed interiors and aft cockpit layouts on the market today. Another reason this craft is a winner is the seemingly endless number of layout variations that can be created. 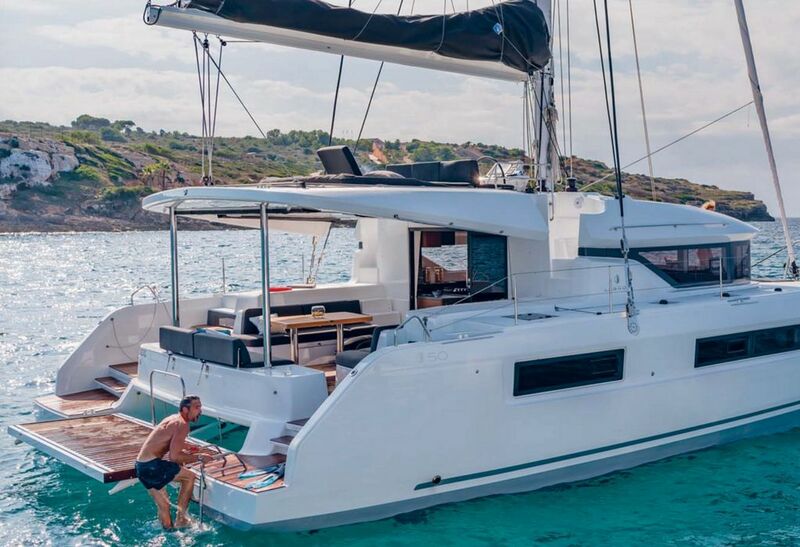 This amazing 50-footer catamaran is available in three, four or even six cabins, and all sorts of variations in between. “It’s another reason this catamaran sells so well,” admits Gailly. The owners cabin is truly luxurious with a walk-around queen bed, a walk-in closet option and a head with separate toilet, shower and vanity areas and double sinks. The closet area comes with plenty of hanging space and drawers and is more than ample for two. The natural light streaming in through the panoramic windows is exceptional and makes all the cabins light and airy.